Sponsor a rider, HOH’s Scholarship program, or a therapy horses! Become a supporter! We invite you to learn about our programs and the benefits they provide. There are so many way to support Horses of Hope Oregon. Please know that by giving your support, you are helping to make a lasting and positive difference in the lives of our participants, and therapy horses. Please take a look at the ways to help Horses of Hope today. If you have any questions or would like any additional information about any giving opportunities please call the Horses of Hope office at 503-743-3890. We need your support and look forward to your participation as we all work towards the goals of health, happiness, and healing over the upcoming year. Note: The Internal Revenue Service allows donors to deduct gifts to charities with 501(c)3 status from their federal and state income taxes. Currently 48% of our clients benefit from Horses of Hope OR’s Scholarship Fund. We are aware that the cost of Equine Assisted Therapy represents a financial burden to some families. Individuals with special needs incur greater expenses related to medical care, education, transportation, recreation, and daily living. Because therapeutic riding provides such profound and positive effects we are deeply committed to ensuring that our program services remain affordable. Horses of Hope OR’s costs to provide this much needed therapy is $115 per session, yet through HOH’s Scholarship Fund we are able to subsidize our clients. Clients and their families co-pay amount is income based and ranges from $5.00 to $35.00. We consider full-pay $35.00 for a lesson. By sponsoring a rider, a lesson, or a term (typically 7-8 weeks) you are ensuring that the power and benefits of therapeutic riding remain accessible to everyone! Now you can support Horses of Hope automatically whenever you make a purchase on Amazon! Just use this link to start your shopping at smile.amazon.com, and log in to select Horses of Hope as your charity. Super easy! Ensuring that our 38 acre stable is maintained is critical to our ability to provide a safe and welcoming environment to our participants. We have on-going needs in this area for financial and in-kind support including fencing, bark mulch, paddock sand, routine equipment repairs, and tractor maintenance. In-Kind giving is the donation of goods or services – such as the donation of hay, equipment, technology or tack. We welcome and accept in-kind giving all year. These donations help to ease the financial load of our programs in many ways. As the donor, you place the monetary value on your contribution for tax purposes. Following is HOH’s ‘wish’ list of items that we need. If you are interested in donating an item or service, please give us a call at 503-743-3890. Corporate sponsors play a significant role in the success of our programs, from benefit fundraisers to marketing. HOH works with Corporate Sponsors to customize their involvement in order to best meet the corporation’s specific philanthropic, marketing and employee interests and involvement needs. Donations can be made in memory of a friend or loved one, two and four legged. Gifts can also be made in honor of a special person or event in your life. If the donor wishes, HOH will notify the designated person, or family in whose name the gift is being given. The horse sponsorship program provides the funds to support the yearly cost of caring for our horses and helps underwrite feed, shavings, horseshoes, veterinary care, tack, stall management, and other indirect costs such as utilities and facilities maintenance. The cost to feed and care for one horse at Horses of Hope OR averages $3,000 a year. For our programs to be safe, effective and successful for our clients/riders, it is critical our horses be healthy, happy, and sound. We are most grateful to those generous individuals, organizations, foundations and businesses that help fund the care and feed for our therapy horses through their annual tax-deductible sponsorships. We rely on our licensed professionals, instructors, and hundreds of volunteers to provide services, as our horses are essential to HOH’s ability to provide our therapeutic riding programs to our clients. There are three sponsorship recognition levels offered to fund the costs to keep our horses in the best possible condition and health. For more information, please contact the Horses of Hope OR Office: (503) 743-3890. Many corporations, over 500 in the United States, have matching gift programs where they will match the charitable contributions made by their employees, retirees, even spouses. Please ask your employer to see if they have a matching gift program. If they do, you may be able to double your gift to HOH. Making a planned gift is an excellent way to help ensure the long-term future of Horses of Hope Oregon. You can make a difference that will last beyond your lifetime, by naming HOH as a beneficiary in your will, on an insurance policy, or in a retirement account. There are many ways in which supporters can create a legacy at HOH. 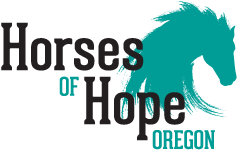 Long-term donations can help sustain Horses of Hope Oregon’s program services. We hope that you will take a moment to consider lending your voice to hundreds of others.